I am a crazy cat lady. And by that, I mean I love cats a crazy amount. I am now the proud owner of three adopted cats (which, I’ll admit, was more than I intended to acquire when I began cat ownership). But I will also admit that three is currently my limit. (Not only is it the limit for the City of Los Angeles, but also for the sanity of my current cats. And perhaps also my boyfriend.) But each time I adopted a new cat, it was the most terrifying and rewarding moment of my life. And here’s why. Smirnoff is my first cat and the one that taught me the most about cats. In the beginning, he was evil. Well, he was actually high arousal. And perhaps a bit younger than the shelter said he was. Basically, he was a teenager going through typical feline teenage stuff (read: biting). I like to tell people how I used to have to go to bed holding a spray bottle, because as soon as I turned off the light and climbed into bed, Smirnoff would pounce and sink his teeth into me. It was a fun game for him. But with the spray bottle, I would get into bed, wait quietly, and then as soon as he pounced, I sprayed him with water. He eventually stopped this behavior. It was also during that first lonely summer, working a terrible summer job, and having to go home to a terrifying cat, that I clicked “submit” on an application to volunteer at the animal shelter where I acquired said terrifying cat. It was an impulsive decision. But sometimes quick, impulsive decisions can have a huge effect on one’s life. At the Animal Rescue League of Boston, I started out volunteering with the dogs. And that was simply because it was the first species-specific orientation I was able to attend. But the interesting thing was, I didn’t really enjoy going to spend with or walk dogs. I’d sneak in and look at the cats instead. The only real volunteer position I did was chop hot dogs in the kitchen, to be used as dog training treats. (Which, for anyone who knows me, is super hilarious considering I hate hot dogs.) But it was during these months of looking—but not touching—the cats that I met Halibut and fell in love. Around October of that year, I went on a date and brought him to the ARL to show off where I volunteered. And even though I was still not a cat volunteer, I opened Halibut’s cage and brought him into a meet-and-greet area. Halibut was so nice, and enjoyed being petted, and I thought to myself, what a cool cat. From that moment on, I made sure to visit Halibut every time I went in to volunteer. So I wrote to one of the other volunteers about how much I wanted to adopt him after the holidays (if he was still there), and she arranged for the cat to go into foster care for a couple weeks. In early January, I picked up a freshly neutered, reeking of cat urine, bald and oozing with sores, cat. I named him Bacardi. Smirnoff and Bacardi were pretty quick to become friends. It was especially lucky as I didn’t really know much about having two cats at the same time. But they played together, and slept with each other on occasion, and groomed each other. They got into trouble together. One time I came home from work to find the entire contents of the freezer defrosted, and a steak and several hot dogs (belonging to my roommate) having mysteriously disappeared beneath their wrappings. And for a long time, two cats seemed just the perfect number. They were a dynamic duo. Party cats. In fact, they loved large numbers of guests that came over my apartment. They would sit among the people, ready to steal the chair of whoever got up to refill their drink. And I became more and more involved at the animal shelter. I found friends there (my “crazy cat lady crew” as I call them). I spent Saturdays helping other cats get adopted, and Mondays working with cats on their social skills, and Smirnoff’s original behavior made so much more sense the more that I learned. And now that he had a friend, he was much better behaved. 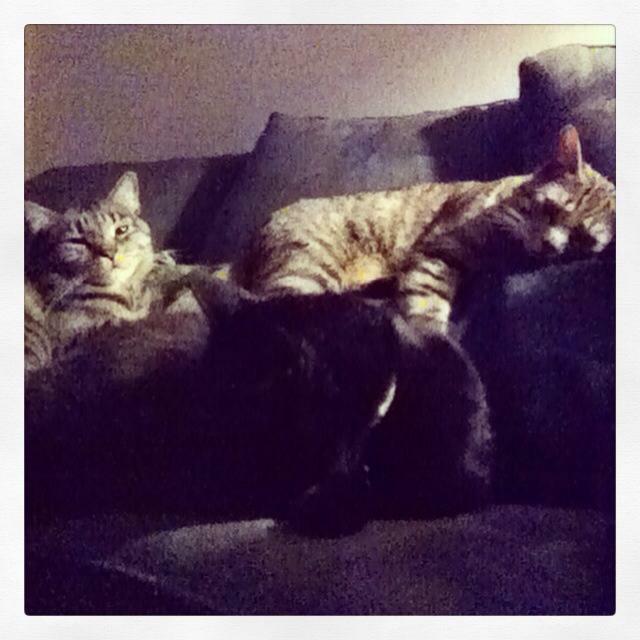 In 2013, I suddenly found myself (and my cats) in a new city. I had a new career. I got to spend all day surrounded by cats and dogs, which was way better than sitting in a cubicle. Although I worked in the main adoptions area of the shelter, I always sneaked into the kitten nursery whenever I got the chance. (Who doesn’t love adorable kittens?) And a year into my new job, that’s where I met Warlow. It was hard not to fall in love with him. Everyone who met him did. The shelter vet carried him around in her pocket. He did nothing except purr if you so much as looked at him. (Whether he could see with his huge abnormal eyes, I do not know.) The medical staff never figured out what was wrong with him, and they ran dozens of tests. And even though most of the seasoned nursery staff were hesitant to say he’d live very long, Warlow grew. Slowly, but surely. Then, at four months old when he was finally big enough to get neutered, I couldn’t let anyone else have him. And even though I had adopted cats twice before, my hand still shook as I signed the paperwork. Because it never fails to hit me that I am not just taking home an animal, but that I am committing myself to taking care of another living being for the rest of its life. So now here I am, five years from where I began. And I have not only Smirnoff, but Bacardi and Warlow, too. Some people might call me a crazy cat lady—and I agree, but based on way more than the number of cats I own! Certainly, when I have one black cat, one tabby cat, and one slightly smaller tabby cat piled on top of me, all snoring and purring away, I am quite content about things. Smirnoff is no longer evil, but the best cat I will ever have in my life (perhaps more on that later). Bacardi is a mamma’s boy and mostly uses his hypnotizing stare to get more food (that he’s not allergic to). And Warlow is a slightly smaller than normal, but still pretty normal-looking cat that keeps the other two active in their middle age. And he flops down next to anyone and purrs like crazy. Trapped under a pile of cats. A crazy cat lady’s dream. New Podcast for CAT LOVERS! There is an exciting new project I’m so happy to be sharing with you… I have recently teamed up with my friend Marci Koski – owner of Feline Behavior Solutions, a cat behavior consultation business. We got together to talk about our favorite topic (CATS) and recorded it all just for you! Our new podcast, CAT CHAT WITH LIZ AND MARCI, brings you insight into the feline psyche with stories, humor, and loads of hands-on experience. In the first episode, we cover multi-cat households: how to pick a new cat for your growing clowder, how to introduce a new cat, and how to prevent/resolve any issues that might arise! TAKE A LISTEN, DOWNLOAD, and SHARE WITH YOUR CAT-LOVING FRIENDS! !